The King is planning on surprising his Queen by growing the biggest garden ever seen. He's counting on you to complete this prestigious task. 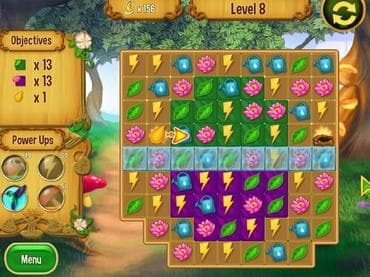 Collect all the tools and flowers you need by completing wonderful match 3 levels. Are you up for this challenge? In a barren kingdom set atop a hill There lived a king and queen, who likely live there still The king was a caring man who loved to please his queen His plan was to grow a garden bigger than there had ever been You will cultivate a sea of bloom; fill the air with the breath of roses From barren land to blossoma sweet bouquet to royal noses A perennial job for a seasoned growera garden for royalty Apply within to serve the queen and be ever rewarded for your loyalty! Free Game features: - 100 Challenging match-3 levels; - 60 garden decorations to choose from; - Several hidden object scenes and memory games as bonus; - Play relaxed, timed and move restricted mode! If you have questions about Queens Garden game, please contact us using this form.